Measure is the first part of a three-stage Schneider Electric power management solution: Measure, Understand, Act, that delivers on modular, interoperable resolutions tailored to meet your immediate needs and scale as your needs change. Let’s look at the advantages of accurate measuring, with future blogs discussing the Understand and Act stages. 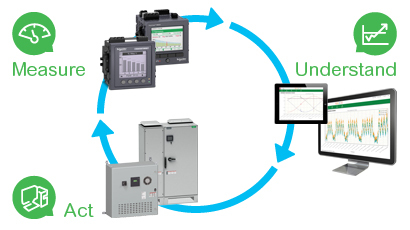 Measuring using innovative Schneider Electric hardware and software offers ways to maximize power system availability and reliability. Measuring also optimizes energy and operational efficiency. Using insights from reporting tools, you can meet or exceed your power reliability requirements within your budget constraints. You can proactively identify power quality issues that can cause outages and increase operational costs. Measuring will enable proactive system maintenance to help avoid costly equipment failures and comply with corporate or regulatory energy standards like ISO 50001. First, let’s look at the value the meter brings. Stand-alone or embedded intelligent meters measure, collect, and deliver essential data from key distribution points across your entire electrical network. Intelligent meters track actual energy usage compared to projected consumption. Meter alarms can quickly flag anomalies in energy consumption. You even can understand energy usage down to the load. They analyze capacity and help reduce peak demand. An energy efficiency program utilizing intelligent meters can help save on a building’s energy consumption and costs. Measuring energy use provides accurate tenant billing and cost allocation for multi-tenant buildings. 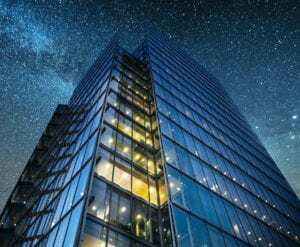 Measuring energy usage with intelligent meters and other scalable products also answers the needs of a multi-tenant building or campus. With submetering, facility managers and landlords can better see energy use, and accurately bill tenants for individually measured utility usage. Not only can energy be measured, but gas and water as well. Measuring for tenant billing can help maximize profits, manage costs and improve tenant satisfaction. Connecting meters at key electrical distribution points in your facility (for example – electrical panels and circuit breakers) can bring significant benefits. There are additional ways beyond intelligent meters to measure your power and energy. Smart Systems powered by Enerlin’X communication devices are connected solutions that use your electrical distribution equipment to deliver relevant information and data. Masterpact™ and Compact circuit breakers and switches also support power management by providing energy consumption data, equipment status, and operational support information. Another way to measure energy is with a Powerlink Measurement and Verification Panelboard (MVP) which is a smart panel that combines electrical overcurrent protection with energy metering. It provides detailed energy use data, even down to the branch circuit level, allowing facilities to reduce waste and improve efficiency. While measuring energy use is the most obvious way data monitoring can benefit a facility, there are other aspects of power that should be measured. The quality of your power is equally important. Damaging and costly power quality issues that can impact your business may be hiding in plain sight. To manage power quality problems you must first measure key power quality parameters. Measuring can help you determine the origin and type of power issues, and help you avoid downtime and revenue losses due to power quality events. Once power quality issues have been identified, corrective solutions can be implemented such as capacitors, voltage regulators, and harmonic filtering equipment. Take control of your energy and start measuring today! Learn more about how to measure power and energy in your facility.